Our Yokohama hosts generously offered to take us on a trip around Mt. Fuji. Although our visit to Japan lasted a whole month, we still ran tight on time. Although we would have liked to have spent more time exploring and climbing Mt. 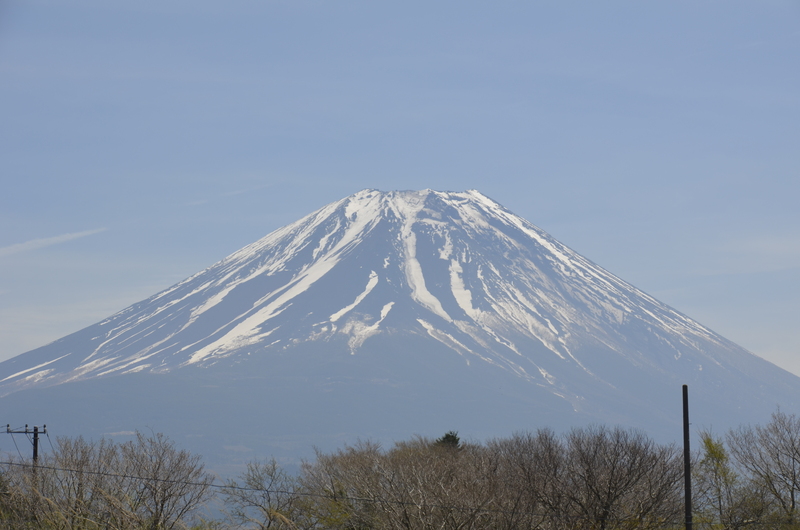 Fuji, we had only enough time for a single day trip … and it was wonderful! We started out from Yokohama bright and early at 6:30 because the drive was about two hours each way. On the way we did something that’s very unusual in Japan, though common here in the U.S.: We ate in the car. We stopped at a convenience store (a 7-11, Lawson Store, or something similar) and picked up boxed lunches. 7-11 stores, sometimes with signs that read “SEVEN & i HOLDINGS” are all over Japan, but the food quality and selection is amazing. Fresh, good-quality boxed sushi, sake, wines (often from Chile and elsewhere), and more are available. So we picked up some sushi lunches and bottled water and headed off down the road. You don’t see people eating while they’re walking or driving in Japan. You will see folks eat lunches on the Shinkansen, but that is about it. Mostly people will take the time to sit down and enjoy their meal with company. As we got outside the endless parade of cities and towns and climbed in altitude, the road got steeper and more curvy. Clouds obscured the mountain most of the time during our approach, but we caught glimpses of it when we arrived along the shore of Lake Yamanaka. Openings in the clouds drifted by and gave us momentary views of Mt. Fuji’s snow-capped peak. Our next stop was Oshino Hakkai Springs. Although there were busloads of tourists strolling through the grounds, the crystal-clear and surprisingly deep eight ponds of Oshino Hakkai were picturesque. There were many shops selling food and souvenirs, and one could peer through the windows to watch buckwheat being ground and milled to make soba noodles. Soba actually means buckwheat, but is also used as the name for the thin noodles made from buckwheat. Our next stop was the Narusawa Ice Cave. An eruption of Mt. Fuji about 1100 years ago caused a lava flow that cooled and formed lava tubes that became the Narusawa Ice Cave. My octogenarian mother and I made it through the cave by navigating steep steps and low areas where the ceiling was less than four feet tall. As we continued around to the eastern side of Mt. Fuji, the clouds dissipated and revealed a less snowy summit. I asked my hosts if they have seen a reduction in snow cover on the mountain over the years. They answered that yes, there has been a slow but steady decline. Our next stop were the Shiraito no Taki and Otodome no Taki waterfalls. The first, the Otodome no Taki falls, means “Stop the Sound” falls. It has varying stories behind the name, with the recurring theme of plotting a revenge murder. The two Soga brothers wanted to murder a rival, Kudo Suketsune, who had killed their father. One story is that the brothers used the roaring sound of the waterfall to avoid being overheard while they made their deadly plans. Another is that they could not hear each other over the roaring falls as they plotted. One finally cried out in frustration that the spirit of the waterfall was torturing them by preventing them from carrying out their revenge. The waterfall’s roaring sound stopped, so they were able to complete their plans and take their revenge. After descending a number of stairs and walking about five minutes beyond the Otodome falls, one comes across the breathtaking Shiraito no Taki falls. The name means “white thread” waterfall. One long look at the panoramic view of delicate threads of falling water requires no further explanation. Our final stop was the Kachoen Flower and Bird park. 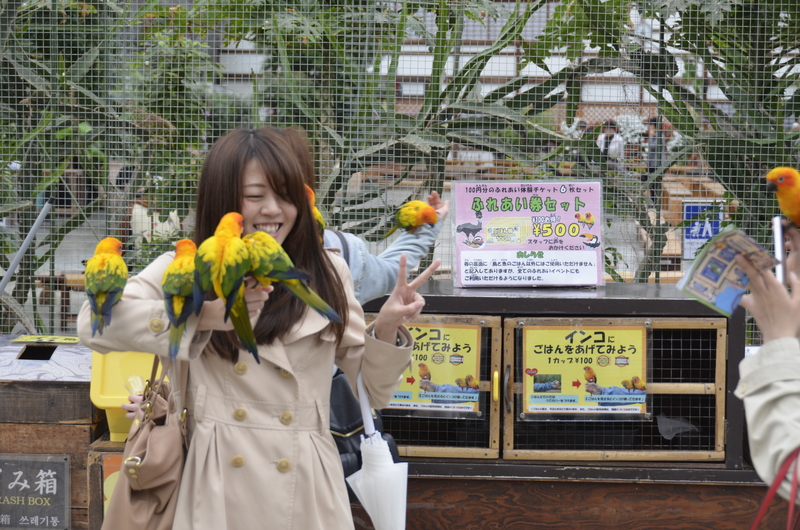 I have written previously about these unusual and colorful flower and bird amusement parks here. We finally headed back and made it home in the evening. Our host, who drove the entire trip for us, really outdid himself. We had an amazing day trip around Mt. Fuji and got to see a lot in one day!